Residents of Warri and its environs in Delta State can now heave a sigh of relief, following the arrest of a notorious kidnap and robbery kingpin at a drinking joint by detectives from “B” Division of the Nigerian Police led by a District Police Officer (DPO), Mr. Aniete Eyoh. The suspect, Anthony Ogbalor, alias Dracula, was arrested at about 7.30 p.m. last Wednesday after a member of his gang was apprehended five days earlier at Enerhen village in Udu Local Government area of the state. Dracula was the leader of the kidnapping gang that killed an Assistant Commissioner of Police Usman Ndanbobo who was the Ughelli Area Commander early last year. Bush radio reporters gathered from police sources yesterday that the build up to Dracula’s arrest began penultimate Saturday when detectives from the “B” Division, Warri, trailed a robbery gang in a snatched navy blue Toyota Corolla with registration number EPE 874 DQ, driving towards Enerhen road in Warri. The source disclosed that at a spot, the detectives wanted to ambush the occupants of the car, but realising that they were being trailed, the occupants opened fire on the police team which was replied with superior fire power. “In the process, the hoodlums jumped out of the vehicle and escaped with fatal bullet wounds. The vehicle was recovered and on being searched, two cut to size locally made guns and four live cartridges were recovered,” he said. It was learnt that the police, acting on preliminary intelligence, also arrested one Kesiena Henry with a grey coloured Honda Accord with registration number GBJ 419 FQ, which was recently snatched at Ozoro community, and upon interrogation he confessed that he was a member of the dreaded kidnapping syndicate. “Kiesena exposed all activities of the gang which led to the arrest of Luckyson Egavers, Akpomeda Williams, Egbe Break and the gang leader, Anthony Ogbalor, alias Dracula. 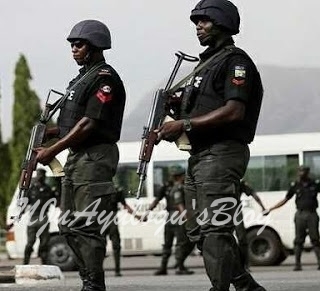 “Mind you, Dracula has been on the wanted list of the police for high profile kidnappings and robberies in Ughelli, Sapele, Warri and environs,” the senior police officer said. It was learnt that Dracula, who is allegedly linked with a serving commissioner in the state, had been arrested several times in the past but was always let off the hook, which emboldened him in his criminal activities. He was said to have been a political thug and had been used by some politicians to settle scores with their opponents, aside his nefarious activities. A senior military source also confirmed that Dracula had been on the wanted list of military formations in Koko, Ughelli and Warri over gun battle incidents with soldiers in the past. The Delta State Commissioner of Police, Zanna Ibrahim confirmed the arrest of Dracula and members of his gang but referred Bush Radio reporters to the press briefing he held on Saturday on the arrest. In a statement, Ibrahim had said one Mr. Frank Otomi and his wife Mofe were victims of the suspects and gave their details as Henry Okejere Kesena, M, 30 years of 234 Warri-Sapele road, Warri; Anthony Ogbalor, AKA Dracula, M, 57 years of No. 1 Omodigbo street, Otoide community in Isoko North LGA; Kosin Henry, AKA Capon, M, 36 years of 134 Eboh-Iyede community, Isoko North; and Kenneth Onome, M, 34 years of Stadium road, Ughelli. Ibrahim said the suspects had on June 23, 2017 at about 19.30 hours, blocked their victims who were driving a Hyundai sport utility vehicle with registration number LSD 344 ER along DSC roundabout, Warri, and whisked them away to an unknown destination. However, on December 23, 2017, while acting on available intelligence, a team of operatives attached to “B” Division, Warri, led by the DPO, had arrested one Henry Okejere Kesena, a notorious kidnapper who had been under the watch of his command. “His arrest and confession led to the arrest of the other suspects who equally confessed to their crimes and their involvement in several kidnappings, including the murder of the late Police Area Commander, ACP Usman Ndanbobo,” Ibrahim said in the statement.